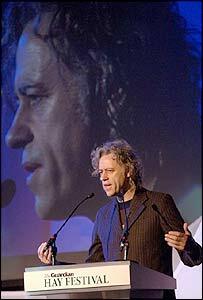 Bob Geldof has made another appeal for people to join in the protest at the G8 summit in Edinburgh next month. He used his annual appearance at the Hay Literature Festival to underline his plea for political action. It follows his announcement about the Live 8 series of concerts to highlight the crisis in Africa. The former Boomtown Rats singer has urged a million people to gather in the Scottish capital as leaders of the world's industrial countries meet. His plea for the gathering has been criticised by police and council officials. But he made no apology and his impassioned plea, received rapturous applause from his audience at the mid Wales event. Geldof urged everyone to join him at the protest in Edinburgh to try to force the world leaders to cancel out African debt, which he said was crippling the continent. "I will not accept any more people dying on my TV in my sitting room every night," said Geldof. "Come with me in four weeks' time," he said. "If we can get the domestic heat to such a level in the UK, Germany, France, Italy, Japan, Canada and the US, it's just possible that we can reach down the ladder and say to those dudes (the African people) 'Let's give you a hand up. "I'm going to do it - I need you to be with me." Geldof was making his regular trip to the festival - this time to launch his book Geldof in Africa - but inevitably the focus of his impassioned speech was the Live 8 series of concerts which he unveiled last week. He told how he had always been reluctant to stage another Live Aid - the global event which put the plight of Africa firmly on the map 20 years ago. But he said he realised with Tony Blair winning a new election term, and also having the presidency of the G8, the "political moment" for a repeat "was now". He spoke of his recent trips to Africa in which he said he had been met by such misery that he "recoiled in horror". He said the summit at Gleneagles could offer the 'political splint' that rejoins Africa with the "rest of humanity and decency". He added that if the same number of people who die each day in Africa, 50,000, were to die in European cities, the leaders would have resolved the issue of Africa's debt "between the breakfast room and the meeting room". Questioned by the audience about why no African musicians had been booked to play at the Live 8 concerts in Hyde Park and Europe, Geldof again said the concerts were a "political not cultural event". Bands like Coldplay, U2 and Travis would be "addressing the world", he said, in a way that lesser-known African artists could not. "We need to create domestic heat in each of the territories - that is the reality of it!" Earlier, another of the Live 8 performers - ex-Police lead singer Sting - earlier told the festival that he had rewritten the lyrics of Every Breath You Take to say "we'll be watching you" as his contribution to the Hyde Park event. "I adore Bob Geldof," admitted Sting, who was at the festival to promote his early years autobiography, Broken Music. "He is an eloquent, passionate man. I would follow him anywhere. "People are realising that there is a constituency in the world at large to do something about Africa. "The threat of Geldof works and I'm going to be part of it."